In a 13 July 1998 editorial, Jean Dominique of Radio Haïti-Inter reflected on the geopolitical implications of World Cup soccer, focusing in particular on Haitian love for the Brazilian national team. This passion, and the political ramifications of soccer, continue to this day. Just last week, the Haitian government raised gas prices during the Brazil-Belgium World Cup match, in very wrongheaded hopes that people would be too distracted to notice. “La France Métisse”: this is the headline splashed across the front page of an Italian newspaper. “Long live King Zidane,” says the one in Algiers – Zidane is of Algerian descent. The victory of the French team yesterday presents certain social dilemmas: Jean-Marie Le Pen’s blood must have boiled to see the Stade de France streaming with black people and beurs (beurs are French people of North African descent). Soccer is no mere sport ; it is something else as well, and the World Cup has geopolitical implications. But in Port-au-Prince, one has to wonder about the phenomenon of Haitians willing to shed their blood for Brazil or Argentina. At first glance, this appears quite strange. In the aftermath of the World Cup, would it not be thrilling and fun to examine how things unfolded at home and elsewhere, beyond technical and professional terms and 4-2-4 formations, penalties, red cards, or semi-finalists? 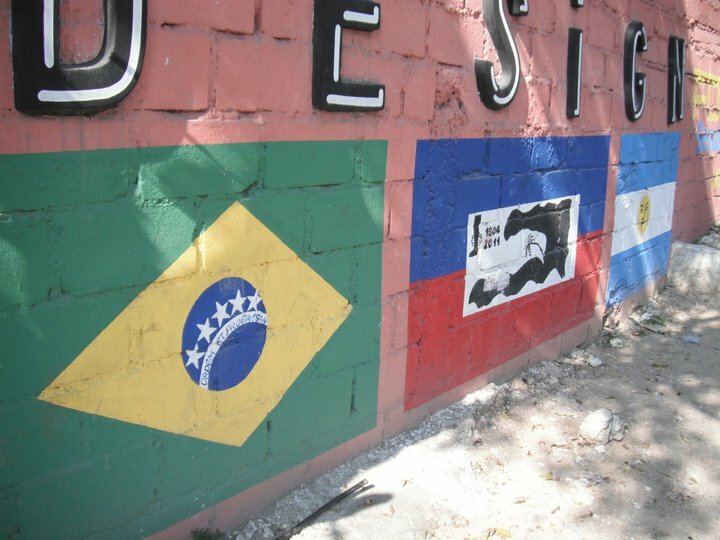 Brazillian, Haitian, and Argentine flags. Photograph by Laura Wagner, 2011. If the vast majority of Haitians are as head-over-heels in love with Ronaldo as are the residents of the favelas of Rio de Janeiro, we should seek the cause of this phenomenon. Is it a sense of Latin-American belonging? Is it a racial reflex? — for Brazil, or at least Brazilian soccer, has been strongly permeated with African diasporic origins. Let’s not forget King Pelé or the brown-skinned Ronaldo himself. But then why would we have in our midst so many fans of Argentina, which has nothing to do with Blackness? Our fervor for and aggressive attachment to foreign soccer teams stem from other factors: outsized love for the game, of course, and in the momentary absence of a national team, the people of our land want to take part in a collective passion. We must love together. And, alas, we must also hate together. Let us recall Carnival ‘98, let us recall those Sundays of sport and culture organized so skillfully by Dady Lescouflair. Throughout all the neighborhoods of Port-au-Prince, we came together to appreciate wholesomeness, sport — all sports! — and painting. And so it must be that for us, soccer draws upon collective urges that have as much to do with politics as they do with religion. Let us add immediately that in Haiti, during this month of the World Cup, the political fervor for Brazil and Argentina would seem at first glance to have nothing to do with imminent political choices; some of the candidates have even argued that soccer represents a new opium to distract the masses from pressing economic concerns… But bear with me. A less simplistic explanation for this phenomenon should allow us to pose other questions, for Haiti’s passion for soccer retraces the very lines that define and connect our world. We should not dismiss the political ramifications: the popularity rating of Chirac and Jospin and France demonstrates that a national team’s victory can be taken advantage of by politicians. But if we zoom out a little more on this World Cup, we discover first off, as did the journalists of Manière de Voir in a special edition of Le Monde Diplomatique that just happened to be devoted to this very World Cup ‘98, that there exists such a thing as a geopolitics of soccer in our world today. It is as global a phenomenon as the economy, but it differs from the globalization of the economy in a crucial way. Whereas the world economy is dominated by the United States, with Wall Street reigning supreme over the stock markets while Hollywood dictates global culture, in the world of soccer, Brazil is the superpower and the United States plays no role at all. One can see perhaps a parallel with today’s geopolitical dynamics, with the main difference being that a global superpower in soccer arouses universal goodwill and the admiration of all, which is not the case for the United States. The latter has had some curious reactions to the World Cup. Earlier today, I recalled yesterday morning’s mise-au-point in the New York Times. I recently noted the francophobia on display in weekly and daily newspapers during the preliminary matches at the Stade de France. Subsequently, the special envoys changed course, bouncing back by highlighting France’s successful organization of the World Cup. But this only further revealed the feelings of exclusion the Yankees feel in the face of the globalization of soccer zeal. Barely 12% of viewers from New York to Los Angeles watched the games, while some thirty-eight billion people, all told, sat before their television screens around the world. A bit of humor emerges, however, from this American sense of social isolation and exclusion — these Americans who, as everyone knows, prefer baseball and American football to soccer — they call it soccer, by the way, not football. Michael Elliott, the resident francophobe at Newsweek, losing his luster, evokes the hope — wait for it — that his compatriots might start playing soccer in the future, and he adds, with a touch of humor, that it is high time for the American barbarians to begin to civilize. Let us recall with some nostalgia that even Shakespeare was anti-soccer and that in King Lear, one finds the king himself addressing a peasant — which is to say, a man of the people — as a “base football-player.” Well, well! 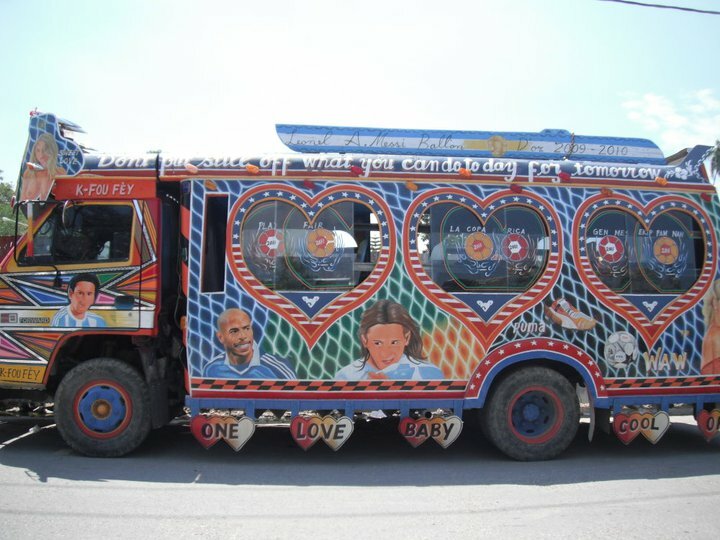 A taptap (elaborately-painted bus) in Port-au-Prince, decorated with images of Argentine soccer star Lionel Messi and other soccer images. Photograph by Laura Wagner, 2011. Special thanks to Dr. Grégory Pierrot for transcription of the original French text. He recently reflected on race, colonial legacies, and what the 2018 French national team represents to French people of African descent over at Africa is a Country. Thanks also to Eline Roillet for help with this translation. Jean-Marie Le Pen was a far-right French politician who espoused explicitly racist beliefs. Evans “Dady” Lescouflair was Haiti’s Minister of Sports and Youth in the late 1990s. Lionel Jospin of the Parti Socialiste was the Prime Minister of France under right-wing President Jacques Chirac from 1997-2002. Ericq Pierre was appointed Prime Minister by President René Préval, only to have his nomination rejected by an obstructionist parliament because he could not prove his Haitian citizenship by producing his grandparents’ birth certificates.